This page lists the undergraduate degree courses offered by the School, including the different variants offered for each course. Select a course below for further information on its technical content including a list of all the course units associated with each course. 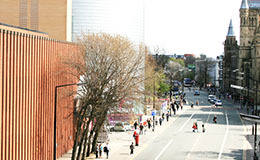 All of the School's degree courses combine study of core computer science principles with the development of a high level of practical skills. The principles and practical skills developed will vary from one degree course to another, but are based around a common core, so that changing between courses is often possible. Click here for a listing of available courses for 2019 entry.